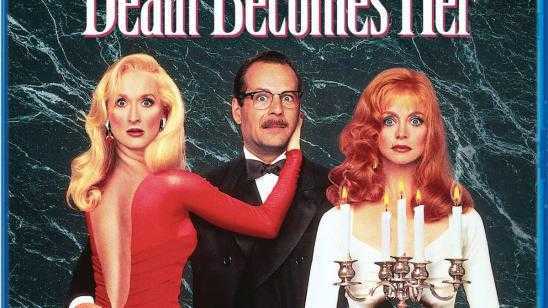 From Scream Factory: We’ve been on a roll with good news this week on various titles so let’s continue that streak with an update on our upcoming (and very anticipated) Blu-ray release of DEATH BECOMES HER! - Street date is planned for April 26th and is available for pre-order now at directly through us at https://www.shoutfactory.com/film/film-comedy/death-becomes-her-collector-s-edition. Pre-order links on other fine online retail outlets will begin to populate within the next month or so. - Director Robert Zemeckis was recently kind enough to do a new interview for us! Because of this and since we have plenty other extras in progress (to be announced at a later date) we have upgraded the release to "Collector’s Edition" status--meaning it will now have a limited-edition slipcover added. - As thrilled as we are (and suspect you are too) about the new "CE" status, we unfortunately will not be able to create new key art on this release due to complicated legal and likeness issues. Therefore, the classic home video art you see here will be on the slipcover and front-facing on the packaging wrap. The reverse wrap will sport the "purple potion" original theatrical artwork. Thank you guys for being patient on this one (we announced it last Summer and it was originally planned for a Dec/Jan release). We hope the wait will be worth it! Official Synopsis: In 1978, in Broadway, the decadent and narcissist actress Madeline Ashton is performing Songbird, based on Tennessee Williams' Sweet Bird of Youth. Then she receives her rival Helen Sharp, who is an aspiring writer, and her fiancé Ernest Menville, who is a plastic surgeon, in her dressing-room. Soon Menville calls off his commitment with Helen and marries Madeline. Seven years later, Helen is obese in a psychiatric hospital and obsessed in seeking revenge on Madeline. In 1992, the marriage of Madeline and Menville is finished and he is no longer a surgeon but an alcoholic caretaker. Out of the blue, they are invited to a party where Helen will release her novel Forever Young and Madeline goes to a beauty shop. The owner gives a business card of the specialist in rejuvenation Lisle Von Rhuman to her. When the envious Madeline sees Helen thin in a perfect shape, she decides to seek out Lisle and buys a potion to become young again. Further, she advises that Madeline must take care of her body. Meanwhile Helen seduces Menville and they plot a scheme to kill Madeline. When Madeline comes home, she has an argument Menville and he pushes her from the staircase. She breaks her neck but becomes a living dead. When Helen arrives at Menville's house expecting that Madeline is dead, she is murdered by Madeline. But she also becomes a living dead and they conclude they need Menville to help them to maintain their bodies. But Menville wants to leave them.